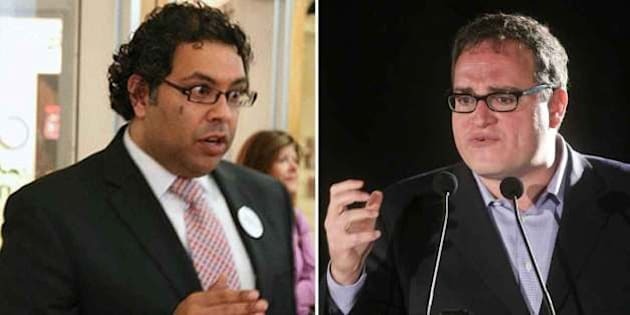 If the war of words between Calgary Mayor Naheed Nenshi and Sun News television personality Ezra Levant wasn't personal before, comments by the popular politician on Thursday removed all doubt. In a radio interview on AM 770 with host Roger Kingkade on Thursday morning, Nenshi said that Levant, a former debating partner in university and thorny opponent of late, is "creepily and weirdly obsessed with me". The salvo is the latest in a verbal cold war that went atomic over the weekend when Levant accused Nenshi of pandering to the environmental left by awarding a City of Calgary contract to the Pembina Institute, an Alberta think tank. The contract was awarded in 2007, years before Nenshi became mayor. Nenshi said the contract, like all city contracts, was awarded on merit and outside politicians' influence. Levant and his Twitter followers went ballistic when Nenshi answered Levant's accusation about his involvement in the award process. The Calgary mayor tweeted at Levant "When did you stop beating your wife," a common debate response to draw attention to a loaded question or a false presumption. Nenshi -- who can be heard on AM 770's audio vault, starting at 10:08 a.m. on Sept. 12, -- sounded upset when Kingkade asked him about the tweet, when according to the mayor it was Levant who leveled "lies" and was "making stuff up," against him. "I can't even believe you're asking me that," said Nenshi, at the beginning of a five-minute conversation on the subject. "The guy called me a liar. He insinuated that I somehow did a quid pro quo for a contract that happened when I wasn't even mayor." But why take the bait in the first place if he wasn't even part of the process, Kingkade asked Nenshi. "You know, in 25 years of getting poked every now and then you want to poke back," responded the mayor. "This is a guy who has been creepily and weirdly obsessed with me for 25 years. "I got a letter in the office a few months ago from his dad, and the letter was scrawled on top of a copy of a letter I had sent his son 20 years ago, saying -- oh my god, imagine this -- you made a bunch of errors in your Sun News column. The guy had kept it for 20 years and he wrote a creepy note on top of it and sent it to me. "This is who we’re dealing with here." @markusoff so this is vengeance for something I said two years ago? And it's been five days & he's still doing media on it? Who's obsessed? But the obsession does seem to be running both ways. Apart from Levant's original nine-minute report and accompanying column on the the Pembina contract, Levant also had a 27-minute spot on Sun News talking about the feud days after the fact, as well as a column on Sun newspapers across the country. Then there are also the countless tweets on the subject on his Twitter feed.